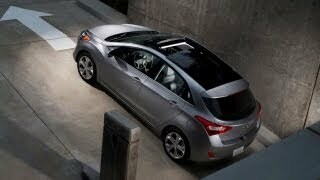 Hyundai introduced the all-new 2013 Hyundai Elantra GT in a North American debut at the Chicago Auto Show. Elantra GT brings five-door functionality and European driving dynamics to the expanding Elantra lineup and is slated to hit dealerships this summer. The lineup now includes Elantra Coupe - also making its world debut today and the popular Elantra sedan, the 2012 North American Car of the Year. 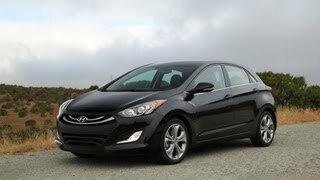 Elantra GT is based on the new-generation i30 2012 model designed for the European market. The 2013 Elantra GT will compete with the Ford Focus, Mazda3 and Volkswagen Golf, featuring more interior volume than these models, unsurpassed fuel economy and Hyundai’s Driver Selectable Steering Mode. Elantra GT is the third vehicle in Hyundai’s 7/11 product initiative (seven new or redesigned models in the next 11 months). The first two vehicles in the initiative were the Veloster Turbo and refreshed Genesis Coupe. The fourth vehicle is the Elantra Coupe. The new Elantra GT represents further evolution of the Hyundai form language, ‘Fluidic Sculpture’ - the company's distinctive design DNA. The ‘Fluidic’ essence provides the Elantra GT with a slippery .30 coefficient of drag. Everything about Elantra GT is aerodynamic from the aggressive profile and low overall height, to the sleek side mirrors. Tire gaps are minimized while rocker panels are streamlined. Lower wind resistance translates into better fuel economy and a smoother ride. Up front, Hyundai’s signature hexagonal grille with chrome accents flows into the hood. The bodyside graphic features a chrome beltline molding to keep up with the sleek character lines. Sharp projection headlamps, fog lights and available 17-inch alloy wheels with chrome spears complete the modern design. Elantra GT’s standard fuel economy is an estimated 28 mpg city, 39 mpg highway and 32 combined with the six-speed automatic transmission or manual transmission. These figures give Elantra GT a highway-only driving range of more than 500 miles and combined city/highway driving range of up to 448 miles. Elantra GT’s widespread use of high-strength steel provides a 37 percent increase in body stiffness at a lower body weight when compared to the outgoing Elantra Touring model. High-strength steel allows the suspension to work optimally. At 2,784 pounds, the automatic transmission Elantra GT is lighter than its competitors, while offering more interior room than Focus, Mazda3, Golf and Matrix. Elantra GT is the lightest five-door hatchback in the compact segment. It is 175 pounds lighter than Focus, 151 pounds lighter than Mazda3 and 222 pounds lighter than Golf. 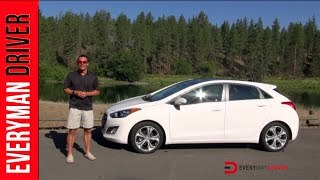 This weight-efficient unibody architecture allows for Elantra to achieve an estimated 39 mpg EPA highway rating, without the need for a special eco model. Elantra GT’s best-in-class fuel efficiency is driven by the Blue Drive strategy. A key to Elantra GT’s extensive use of high-strength steel is an $8 billion dollar investment Hyundai made to become the only global automaker with its own fully integrated steel plant. Hyundai has 400 metallurgists focused on the task of developing optimized steel recipes for every part and panel in new vehicle architectures. Under the hood, Elantra GT is powered by a 1.8-liter Nu four-cylinder engine with 148 horsepower and 131 lb-ft of torque (145 horsepower and 130 lb-ft of torque for Elantra PZEV). Thanks to advanced clean engine technology, most Elantra GTs sold in California, Oregon and several Northeast states are certified as Partial Zero Emission Vehicles (PZEV) by the EPA. The PZEV Elantra GT is as clean as many hybrid electric vehicles, helping Hyundai meet its environmental commitments. Elantra is also available as an Ultra Low Emission Vehicle (ULEV). 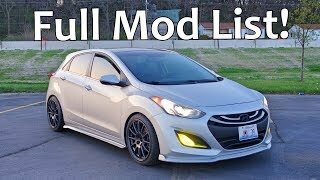 Additionally, Elantra GT has an ActiveECO System that modifies engine and transmission control to smooth out throttle response and increase real-world fuel economy by up to seven percent. The Nu engine features an aluminum cylinder head, crank and block with a cast iron cylinder liner. The 1.8-liter Nu also offers Dual Continuously Variable Valve Timing (D-CVVT) camshafts and hydraulic engine mounts for optimum power, efficiency and refinement. Using CVVT on both camshafts has several advantages when compared with using it just on the intake camshaft. With D-CVVT, there is a two percent improvement in performance (increased volumetric efficiency), two percent improvement in fuel economy (reduced pumping loss) and a 30 percent reduction in hydrocarbon emissions. In the valvetrain, roller swing arms and hydraulic lash adjusters reduce valve driven friction to improve fuel economy by one percent, compared with direct valve driving. The Nu engine also features a maintenance-free silent timing chain system to enhance durability and improve Noise Vibration and Harshness (NVH). The application of a composite resin two-stage Variable Intake System (VIS) versus aluminum, enables switching between long and short intake manifolds, resulting in a four percent improvement in performance, a 15 percent reduction in cost and a 30 percent reduction in weight. Another tool Hyundai engineers have incorporated into Elantra GT is an electronic throttle control. The electronic throttle control replaces the conventional cable and mechanical linkage with fast responding electronics. This system accurately controls air intake and engine torque, improving drivability, response and fuel economy. The 2013 Elantra GT can be equipped with a six-speed manual (M6CF3-1) or automatic (A6GF1) transaxle with SHIFTRONIC® manual control. Elantra GT’s six-speed manual transmission provides short, crisp shifts and further optimizes engine performance. These crisp shifts are courtesy of triple-cone synchronizers for first and second gears, double-cone for third gear and single-cone for fourth, fifth and sixth gears. Maximizing interior volume and delighting customers with various seating layouts are hallmarks of Hyundai engineering and translate into more cabin room, cargo space and versatility. The Elantra GT features seating layouts that can comfortably seat five people or accommodate four passengers, plus long items like golf clubs or snowboards. Fold down two seats, to seat three people and hold larger packages or fold all of the back seats to get CUV-sized cargo space. These options allow customers to discover that Elantra GT has more interior volume than Matrix, Mazda3, Ford Focus and VW Golf and even more cargo capacity than the Nissan Juke crossover, thanks to fold-flat rear seats and rear seat cushions than can flipped upward. The Elantra GT includes a number of convenient, standard stowage and storage features, including a sunglasses holder, two front and two rear cupholders, door bottle holders, cooled glove compartment, central console storage, sliding armrest, front storage tray, front seatback pockets and a cargo area under-floor storage. The cargo area also has a 12-volt outlet for consumers who desire an outlet to plug in their portable electronic devices. Elantra GT is fitted with a MacPherson strut front suspension, with coil springs and gas shock absorbers. The rear suspension is comprised of a light weight coupled torsion beam for enhanced steering stability and monotube shock absorbers. A 22 mm diameter front stabilizer bar helps reduce body roll when cornering. Elantra GT is tuned for added feel, responsiveness and control, while the Elantra sedan is tuned for comfort. Modifications to the GT include higher rear spring rates, a stiffer twist beam and Sachs dampers for improved body motion control. These changes create driving dynamics which are sporty and comfortable. In addition, two suspension packages were developed to optimize tuning for the two different tire sizes. The Elantra GT’s Style package offers a sportier suspension calibration that is optimized for its lower-profile P215/45R17 tire. Behind the wheel, drivers benefit from Hyundai’s all-new Driver Selectable Steering Mode. With three operating modes to select - Comfort, Normal and Sport - this innovative system allows drivers to adapt Elantra GT steering characteristics to varying driving preferences and road conditions any time they choose. Comfort level offers the greatest ease of steering and is ideal for city and parking environments. Sport is optimized for higher-speed highways or winding roads, while Normal is ideal for a mix of driving conditions. The Driver Selectable Steering Mode not only adjusts power assistance levels in each mode, but also on-center build-up feel and steering build-up curves throughout the steering range, for a very natural, progressive feel. Steering damping characteristics, active return gain, and high frequency friction levels have also been optimized for Elantra GT in this system. Even more, Elantra GT’s turning diameter of 34.8 feet is better than Matrix, Focus and Golf. The all-new Elantra GT rides on a 104.3-inch wheelbase and has an overall length of 169.3 inches. The height is 57.9 inches and the width is 70.1 inches. Cabin refinements on the all-new Elantra GT are inspired by the high standards of the entire Hyundai lineup. Located in the center console, the available navigation system is displayed via a seven-inch touch-screen and incorporates the rearview camera screen. Elantra GT’s rearview camera is like no other. This mechanized camera is hidden behind the Hyundai flying H badge on the rear hatch and only appears when needed. Elantra GT comes standard with a 172-watt AM/FM/Satellite Radio/CD/MP3 audio system with six-speakers and iPod®/USB/auxiliary input jacks. A Bluetooth interface is also standard. The sound system plays compact discs, accesses digital music files via Bluetooth streaming audio or allows driver and passenger to access their personal listening devices through the iPod/USB/auxiliary inputs. The SiriusXM Satellite Radio interface is also integrated into the navigation unit and features channel logos, real-time NavTraffic and Data services, such as NavWeather®, Stock Ticker and Sports Ticker. Users can even upload personal pictures from a USB rather than a CD to be displayed on the system’s home screen. Blue Link-equipped vehicles include core safety services for an introductory period. These key safety services include: Automatic Crash Notification (ACN) and Assistance, SOS Emergency Assistance, and Enhanced Roadside Assistance. After the introductory period, owners of Blue Link-equipped vehicles can choose to extend these and other services as desired. Blue Link Assurance further expands Hyundai’s industry leadership formerly established by Hyundai Assurance, the industry’s most comprehensive suite of new-vehicle protection. The all-new Elantra GT features the latest active and passive safety technologies to ensure maximum protection for its occupants. Active safety features include ESC (Electronic Stability Control), ABS (anti-lock braking system) with Electronic Brake-force Distribution and Brake Assist and VSM (Vehicle Stability Management). In terms of passive safety, the Elantra GT will be fitted with seven airbags as standard - front, side and curtain including an Elantra-first driver's knee airbag.